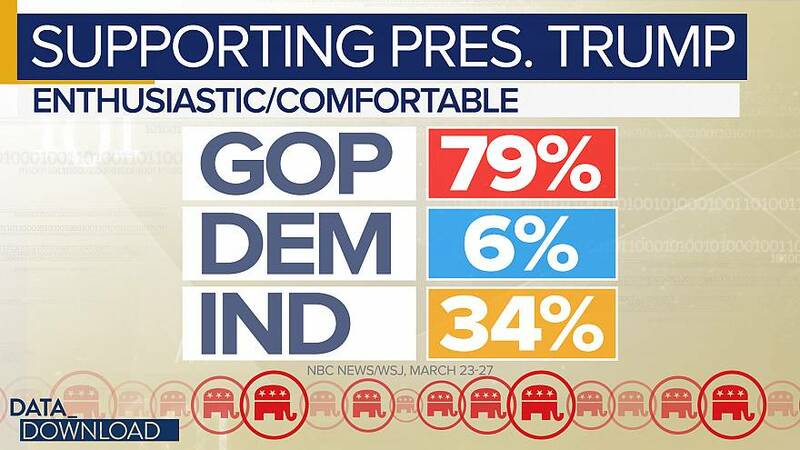 Republicans look to be all in on the president, with 79 percent saying they are enthusiastic or comfortable. WASHINGTON - Before citizens can actually vote for a presidential candidate, they first have to be comfortable with him or her and this week's NBC News/Wall Street Journal Polloffers some clues about where voters stand on the growing (and growing) 2020 field.The poll shows some serious challenges for President Donald Trump, some good news for former Vice President Joe Biden and growth potential for some of the Democrats' fresh faces.Let's start with one candidate who seems pretty certain to be on the ballot in 2020, President Trump. The overall number shows some reason for concern at the White House. Only 40 percent of those surveyed said they felt "enthusiastic about" or "comfortable with" candidate Donald Trump. 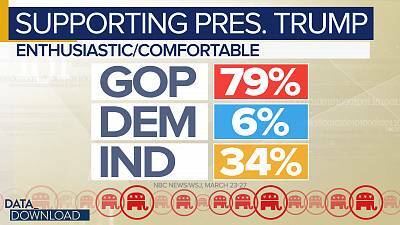 Republicans look to be all in on the president, with 79 percent saying they are enthusiastic or comfortable. As you might expect, Democrats are at the opposite end of the spectrum, with only six percent saying they feel that way about the president.But the real story in the data may be independents. Only 34 percent say they are enthusiastic about or comfortable with Trump. A full 64 percent say they have reservations or are very uncomfortable with him. That's a pretty big deficit for the president to hold with a key voter segment, out of the gate.What about the Democrats? The NBC/WSJ poll tested five names in this survey: Biden, Vermont Sen. Bernie Sanders, Massachusetts Sen. Elizabeth Warren, California Sen. Kamal Harris, and former Texas Rep. Beto O'Rourke.Joe Biden, the candidate who has not yet formally announced his intention to run has the best set of numbers - 47 percent of those surveyed said they felt enthusiastic or comfortable with him. Following him were Sanders at 37 percent, Warren at 30 percent, Harris at 25 percent and O'Rourke at 23 percent.But to get a deeper view, the Data Download wanted to look at how each of the Democratic candidates did with Democrats, Republicans and independents. After all, the general election and primary voters can look very different. Even in this more refined breakdown, however, a familiar pattern emerged.Among self-described Democratic voters, the candidate order was Biden, Sanders, Warren, Harris and O'Rourke. Among self-described Democratic voters, the candidate order was Biden, Sanders, Warren, Harris and O\'Rourke. The numbers were higher, of course. Biden was at 70 percent enthusiastic or comfortable. Sanders was at 60 percent. Warren was at 52 percent. Harris was at 50 percent. O'Rourke was at 44 percent.But beyond that, there were no remarkable differences. 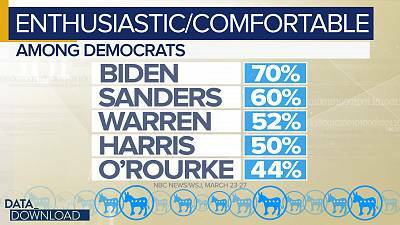 With each candidate, the number of Democrats who were "comfortable" was larger than the number that were "enthusiastic." And if you are wondering whether one candidate had an edge in the intensity department, Biden had the largest "enthusiastic" number with Democrats as well.Looking at self-described independents, the same candidate order basically held - Biden, Sanders, Warren, O'Rourke and Harris - with lower levels of support, of course. Overall, however, Biden and Sanders seem to have an advantage with independents. Overall, however, Biden and Sanders seem to have an advantage with independents. Each polls in the 40s - 49 percent and 48 percent respectively. Beneath them is a clear second-tier of candidates with Warren is at 26 percent, O'Rourke at 20 percent and Harris at 18 percent.And Republicans follow the same pattern - albeit at much lower numbers. Biden stands out from the crowd here, with 21 percent of Republicans saying they feel enthusiastic or comfortable with him. Biden stands out from the crowd here, with 21 percent of Republicans saying they feel enthusiastic or comfortable with him. That could suggest he has some crossover appeal if he runs and wins the nomination.The rest of the field is in the single digits among Republicans. Sanders and Warren are at eight percent. Harris and O'Rourke are at four percent.Add it all up and there is a lot of good news for Biden in the poll and, perhaps, a bit of a surprise that essentially the same order of preference exists among all partisan affiliations.One question emerges in the data, however, around the Democrats fresher faces for 2020. Is there a reason why Kamala Harris and Beto O'Rourke consistently appear at the bottom of these rankings?Yes, those two candidates also received the highest numbers in this poll by far for "don't know the name" and "not sure." Overall, 34 percent of respondents said "don't know" or "not sure" for Harris and 36 percent chose those answers for O'Rourke.That could be viewed as a problem, of course. Name recognition is a crucial component of any campaign, particularly in the massive presidential field that is taking shape.But those numbers also mean that Harris and O'Rourke have a better chance to define themselves on their own terms in the campaign ahead. With nine months left before the year 2020 even arrives, that's not necessarily a bad position to hold.